Monsters and Mutiny Festival at Collins! 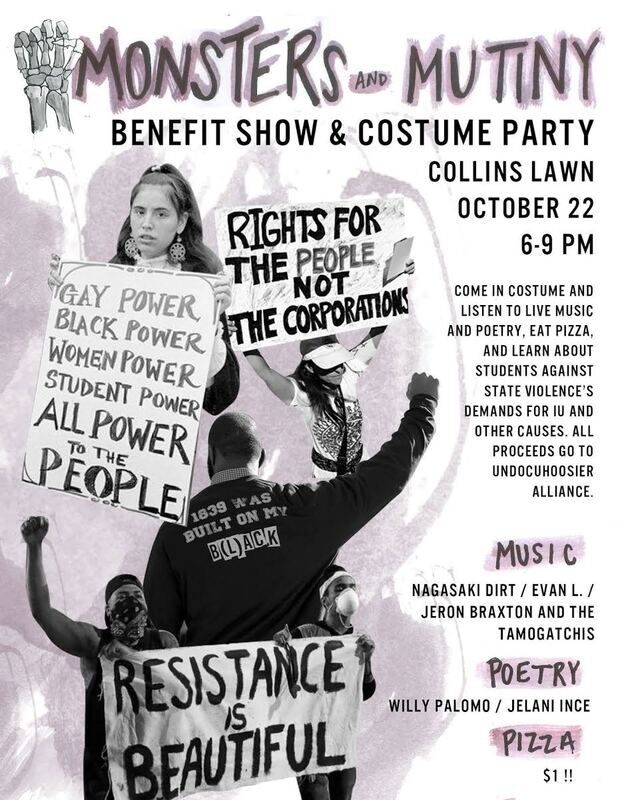 Filed under Event and tagged benefit, IU, students |	Comments Off on Monsters and Mutiny Festival at Collins! A list of autonomous events and actions organized around Bloomington for the June 11 Day of Solidarity With Long-Term Anarchist Prisoners. Reposted from June11.org. 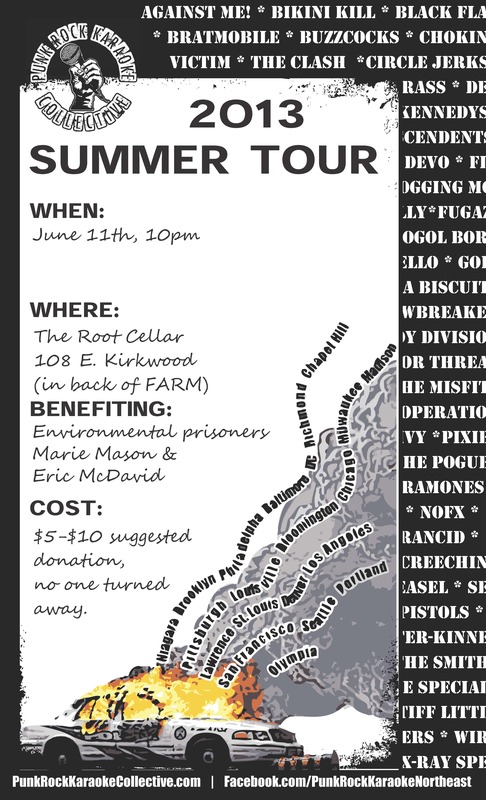 -For the June 11th day of solidarity with longterm anarchist prisoners, comrades in Bloomington, IN hosted an event which sought to connect outside supporters with those struggling behind bars. We listened to pre-recorded interviews with two rebellious prisoners– Leon Benson, a rebel serving a 60-year sentence in Indiana who has participated in prison struggles and recently got out of a ten-year term in solitary confinement, and Michael Kimble, a black gay anarchist being held captive by the state of Alabama since 1986. Leon was also able to call in to the event and fielded questions from audience members about the conditions of long-term imprisonment and the relationship between struggles outside and inside prisons. Michael was unable to call in due to oppressive state-sanctioned time standardization (time zone misunderstanding). We also read an incendiary statement from anarchist prisoner Sean Swain and signed cards and wrote letters to several long-term anarchist prisoners from the U.S. and around the world, including Marius (Marie) Mason and Eric McDavid. The event raised $600 for Marius and Eric. -In Bloomington, supporters hosted a late-night pub quiz night at a local vegetarian restaurant. Players formed teams and answered a variety of challenging trivia questions, while enjoying fried vegan snacks and beer. The packed house raised over $250, which was split between Marius’ cats and a local Farm Animal Sanctuary. Funds raised for the sanctuary were matched by a generous anonymous donation. -We glued the locks of a Bloomingfoods, a local green capitalist “co-operative” enterprise, because we find it disgusting that a town that once nurtured the fighting spirit of Marius Mason pacifies itself with feel-good shopping in the face of environmental destruction. We also painted “death to cops and snitches” on a local bridge. Part of the celebrations for this year’s June 11 Day of Solidarity with Long-Term Anarchist Prisoners. It starts at 2pm, and you get five cupcakes for five dollars. 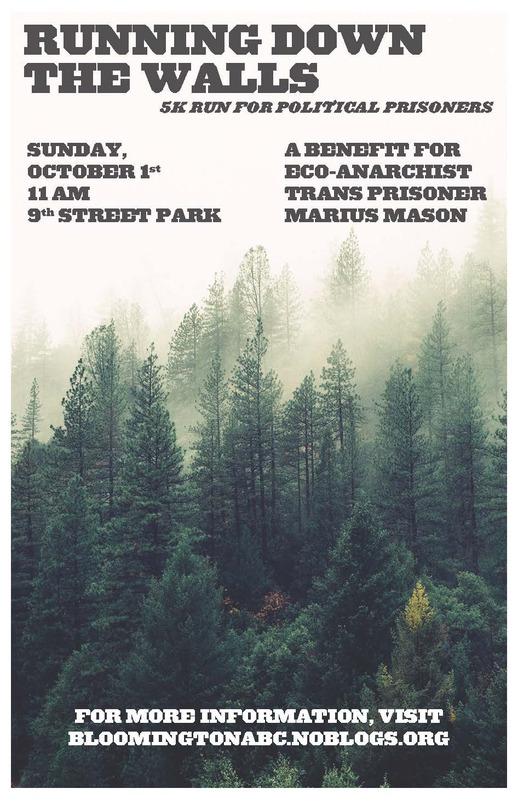 It is a benefit for Marie Mason.